(MoneyWatch) If you are a high school senior, you already know that it's college application season. Facing your admission to-do list is intimidating, but it doesn't have to be, according to Alison Cooper Chisolm and Anna Ivey, co-authors of the new book, "How to Prepare a Standout College Application: Expert Advice that Takes You from LMO* (*Like Many Others) to Admit." Students who want to create awesome applications must create a plan, said Ivey, a former dean of admissions at the University of Chicago Law School and founder of Ivey Consulting. 1. Allow enough time for your plan. Ivey and Chisolm estimate that it takes about 100 hours to complete eight to 12 college applications. Scheduling that much time will prevent high-schoolers from scrambling at the last minute which can lead to mistakes. Budget 100 hours and if it doesn't need that much time, congratulate yourself. 2. Know what the application requirements are for each school. A college application is not a single document that you can complete online. In addition to an application, you might need to submit supplemental material. Colleges also routinely require a high school transcript, test score report and a recommendation from teachers and/or a counselor. The application process might also require an interview. International and home-schooled students may face even more requirements. Check for application requirements on each school's website. 3. Look for ways to share the same information among multiple schools. Once you know what each college on your list requires, you can determine what opportunities you have to "do it once" and "use it twice or more." The Common Application allows students to share some information just once while applying to multiple schools. Many of the questions on college applications are similar to each other, and you will probably find that you can use one answer for different applications. Teenagers shouldn't reuse answers, however, unless they actually respond to the question being asked. My older brother was trying to get a report on birds written that he'd had three months to write, which was due the next day. We were out at our family cabin... and he was at the kitchen table close to tears, surrounded by binder paper and pencils and unopened books on birds, immobilized by the hugeness of the task ahead. Then my father sat down beside him, put his arm around my brother's shoulder, and said, "Bird by bird, buddy. Just take it bird by bird. For teenagers, the father's advice can be summed up this way: "Just take it application by application." 5. Beat the submission deadlines by one to two weeks. College application submission deadlines are firm and there is little or no forgiveness for those who miss them, Ivey said. 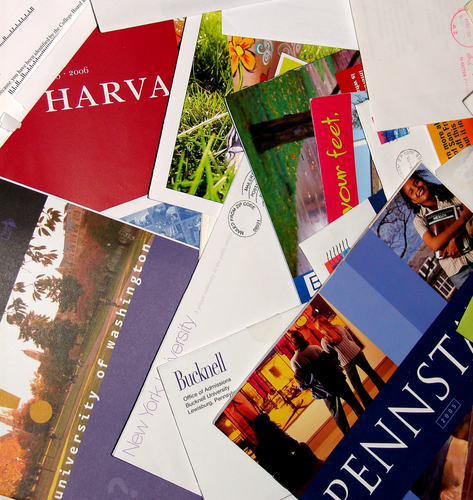 Fail to submit your application on time at many colleges and your admission chances are zero. And it won't matter what your excuse is or how much you beg. If you submit your application early, getting sick, having a computer malfunction or even something more serious won't hurt your chances. You'll still have time to make your deadlines.